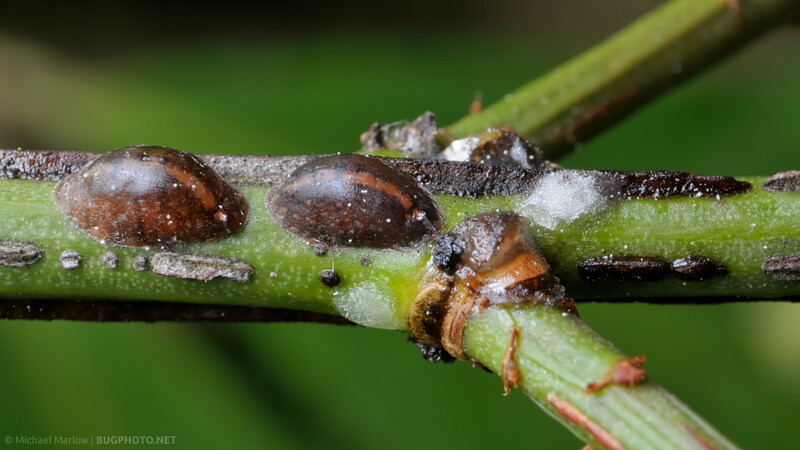 These unremarkable, simple structures are actually animals known as scale insects. I don’t really have a lot of knowledge about scale insects, often referred to simply as scales, but what odd little creatures! Being in the order Hemiptera means they have a shared lineage with stinkbugs, assassin bugs, aphids, et al., which is quite astonishing just going by the looks of it. Just looking at them, it’s hard to believe they’re animals! BugGuide.net tells us that they are plant parasites; that as females mature they lose appendages and begin to look more like growths than insects (as seen above! ); and that males are generally unnoticed but may look like a winged aphid. All in all, an odd little beast that proves, you just never know what you might find if you go looking. Posted in HemipteraTagged Coccoidea, hidden creatures, scale insect, scales, unusual animalBookmark the permalink. Yes, I’m sure I’d overlooked them until I chanced upon reading about them online somewhere. Very happy I could introduce you to something new and interesting, that’s the best for me! Very interesting. They remind me of both shells I used to find in the St. Pete’s Beach, Fl. area and, to some extent, of box turtle shells. They are so peculiar, and a shell makes more sense than the back of an insect. But that’s mother nature for you, rearranging our sense when we think we’ve got it down. Michael you might like to know that ‘Scale Insects’ although still in the order Hemiptera, sub-order Heteroptera, have now been separated from the terrestrial and aquatic ‘true bugs’ into a further sub-order Stenorrhyncha, along with the Aphids, Whiteflies and Psyllids! Thanks for the info, Marc, always appreciated! Just came across these for the first time on a basil plant we’ve been growing for a year (indoors). There weren’t any 2 weeks ago. There were SO many of them, that I picked one off to see what it was, looked under a high powered magnifier, and saw that these were shell casings with dozens of white little eggs inside. You could not see that they were eggs to the naked eye, it only looked like “dust” inside. I put the entire plant in a plastic bag, sprayed it with alcohol and citrus oil spray, sealed it tight and threw it out. “FREAKED ME OUT”. The basil plant was a “gonner” anyway.